Sunshine is back! Temp in the 40s. I discovered that there is a painting by Giacometti at Notre Dame des Champs which is about 15 minutes away on foot, so we walked up there to see it after breakfast. It’s an interesting 19th century church. 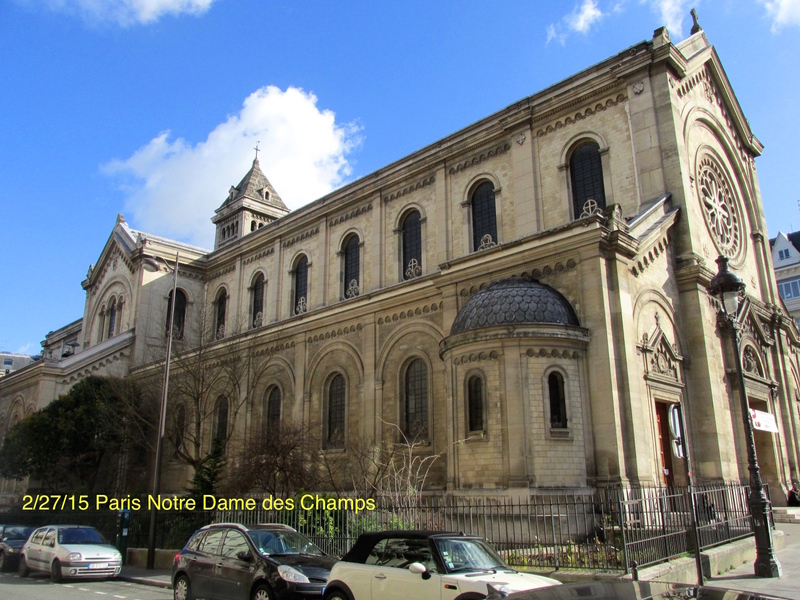 It is up on Montparnasse which is noticeable uphill walk of about 20 minutes. If I do not hurry and get this posted, it will be one day late since it is almost midnight here in France. It was a long day with 3.5 fitbit miles logged. Most of it was in metro stations as we took the 6 and the 1 out to “Etoile” (Arc de Triumphe) to meet Nicole and go to see the Louis Vuitton Museum, and walking up the aisle for Ashes and Communion at St Gervais. We were off to a slow start this morning. I headed over to the street market around 8:30 and picked up some fruit, a baguette, and some croissants for breakfast. Our social calendar filled up too as I set up some times to visit Bishop Doré, Katherine Lucas, and Nicole and Jean. The fitbit reports 5.3 miles of walking today, and the score today is 2 to 1: two Museums over one Church. It all happened in the Marais without a lot of rushing around. A cloudy day with temps in the mid 40s made it a perfect day of indoor explorations. The metro got us to the Marais around noon, and the metro station is directly in front of the Church of St Paul and Louis built in 1627 by the Jesuits.